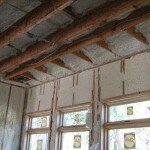 How many hours per year do we have cooling calls in well insulated buildings when the outside air is 55⁰F or less? 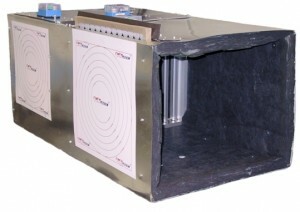 Would you like to have 100% ventilation manually and/or programmable through the thermostat? What if you had a return air plenum operating as an economizer and had all the dampers built into the plenum? Just install the starting collars, hook up outside air duct and exhaust duct to outside louvers and connect economizer controls. 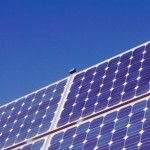 Save approximately 20% of total yearly cooling run time USING FREE COOLING. EconoPLENUM™ is 4’ long. 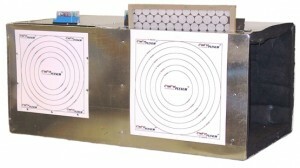 The 21” x 25” connection dimensions allow a direct connection to most 4 and 5 ton filter/air cleaner frames or directly to equipment. 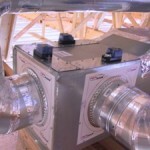 The 2” duct liner is more than adequate to acquire the points needed in high efficiency programs including LEED. Our motors are power open/power close. Red and green LED’s on the motor show the damper position easily and quickly. The dampers are gear driven and opposed blade so that reliability is unquestionable and leakage is less than 5%. A damper (called a return damper) separates the front half of the plenum (toward the equipment), from the back half of the plenum (toward the endcap). Install ALL return air duct in the back half of the plenum. When the return damper closes, all return air is stopped from entering the equipment and the outside air damper opens along with the exhaust damper. 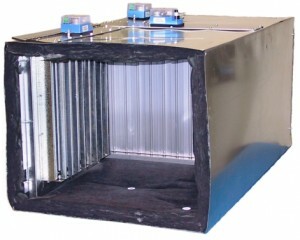 The outside air damper has a 1” thick 20” x 20” pre-filter mounted just before the damper. 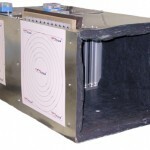 This outside air filter/damper is mounted in the front half of the plenum and will accommodate a maximum outside air duct of 16” x 16” (or 16” round). This damper will allow 100% outside air to cool when conditions are suitable or just ventilate upon manual request or programming. The exhaust damper will accommodate a maximum exhaust air duct of 14” x 14” (or 14” round) mounted in the back half of the plenum with the return air duct. Order the outside air and exhaust dampers on the left or on the right to accommodate the easiest installation application. Economizer sequence of operation: On a call for cooling, the economizer controller first checks outside air temperature. If outside air is suitable (the right temp and humidity thru an enthalpy sensor), the outside air and the exhaust air dampers open. The return damper closes (between the front and back half of plenum). This eliminates return air from coming into the equipment and allows only outside air to be drawn into the return air opening of the equipment. Since the air is suitable for cooling there is no need for the condensing unit to be energized so the cooling is free (except the blower motor). The entering air sensor measures temperature entering the equipment. If the entering air is too cool to be comfortable even during a cooling call, the economizer controller will allow the return damper and the outside air damper to modulate so as to mix a little return air with the cold outside air. This mixing process will maintain an entering air temperature, say 55 ⁰F and is adjustable. As the outside air is pumped into the building, the positive pressure is pushed through the return air duct, into the back half of the plenum, and pushed out the exhaust duct. Remember, the middle return damper is closed, not allowing return air into the machine. Ventilation Mode: If Mr. Jones burns the bacon, he may be looking for a way to ventilate his home before Mrs. Jones get home. Here’s the solution. Remember the old whole house attic ventilation fan? We had to open windows and screen doors so that we pull air through the home then using a big fan mounted in the ceiling of the hall, blow the air out through the attic. The problem was we created a nasty negative pressure on the building and brought everything from the outside into the home. Also, for security reasons, we don’t leave windows and doors open like we used to. 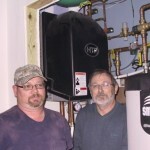 EconoPLENUM offers the same ventilation, but we pressurize the building and pre-filter the air before we bring it in. Then, we use the air handling equipment filtration and blower to ventilate. 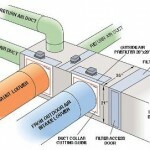 Finally, the air moves through the building and into the return air duct, into the back half of EconoPLENUM, then through the exhaust damper and out the exhaust duct to an unobjectionable place such as the garage or perhaps a covered patio. Many high end thermostats include programmable relays that allow the occupant to manually operate external equipment. Two wires tied from the thermostat into the economizer controller will allow 100% ventilation of the building when the thermostat relay calls. As we offer our products to the Air Conditioning Contractors through distribution in some locations and directly where no distribution has been established, we realize that training, project consulting, even down to our free freight policy is necessary to support the sales efforts of the HVAC Contractor. We appreciate every piece of product that you buy from Comfort Products, Inc.
For information, training and support call Greg Talley at (817) 349-6966 or email at gtalley@comfortproductsinc.com.